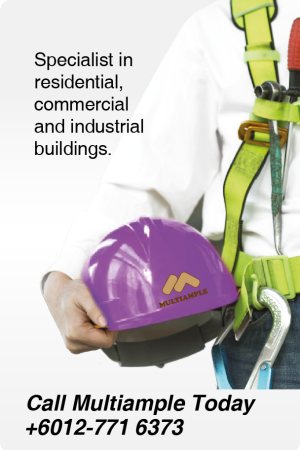 In Multiample, we provide the most ethical, efficient and professional plumbing services is the foundation that our business is built on. Our knowledge and experienced plumbers can handle quickly with high quality all kind of plumbing problems you have that will exceed your expectations. Our comprehensive hydraulic services include cold water and sanitary plumbing services. Cold water is the system that enable incoming clean water from the main bulk water to supply for the whole residential, commercial or industrial building. Sanitary plumbing service is the system to discharge waste water from the building to sewerage system. There was a lot of building started to follow GBI standard (Green Building Index) nowadays, so that rain water down pipe services is necessary. Rain water down pipes services is the system to collect water from the rain and recycle or reuse it for other propose eg: toilet flushing, irrigation for agriculture and further more. Water reticulation system is tapping from SYABAS main bulk meter water to supply water around the building area. Installation of pillar hydrant will be easy for fireman to pull out the fire whenever the fire incident happens. Sewerage reticulation system consists of a few important component parts which include manhole, inspection chamber and vitrified clay pipe. This system is used to discharge and channel out waste water to the sewerage treatment plant and oxidation pools. All kinds of pipes including copper pipes, UPVC pipes, HDPE pipes, galvanized iron pipe and so forth need to be replaced after a few decades because these pipes may lead to water leakage or rusty if internal pipes. Besides specialize in plumbing services, our company also offers air conditioning services come with installation of air conditioner (split unit type only). We also provide services to repair the air conditioning to keep your air conditioner in good condition to save your electricity cost.